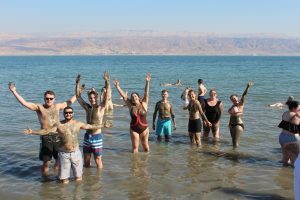 Israel Reflections 2017–Trust is Optional–Last Blog of the Trip! 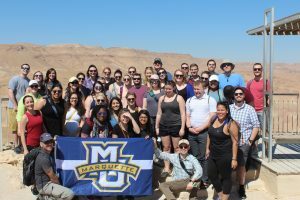 By: Andrea K. SchneiderPosted on May 13, 2017 Categories International Law & Diplomacy, Marquette Law School, Negotiation, PublicLeave a comment» on Israel Reflections 2017–Trust is Optional–Last Blog of the Trip! This trip we added a few new places and this was one of them. As student Jessica Lothman reflects in this post, this particular bridge was filled with history, symbolism, and hope. Einstein put forth his theory of relativity in 1915 having determined that massive objects cause a distortion in space and time—this force is felt as gravity. 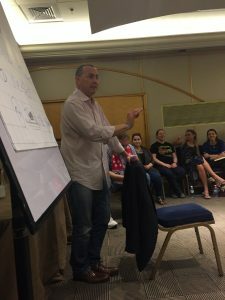 Traveling through two-thousand years of history in eight days exerted its own gravitational force, with each speaker and landmark along our route from Jerusalem to the ancient Jaffa port in Tel Aviv pulling and pushing my perspective on conflict resolution in the context of Israel. 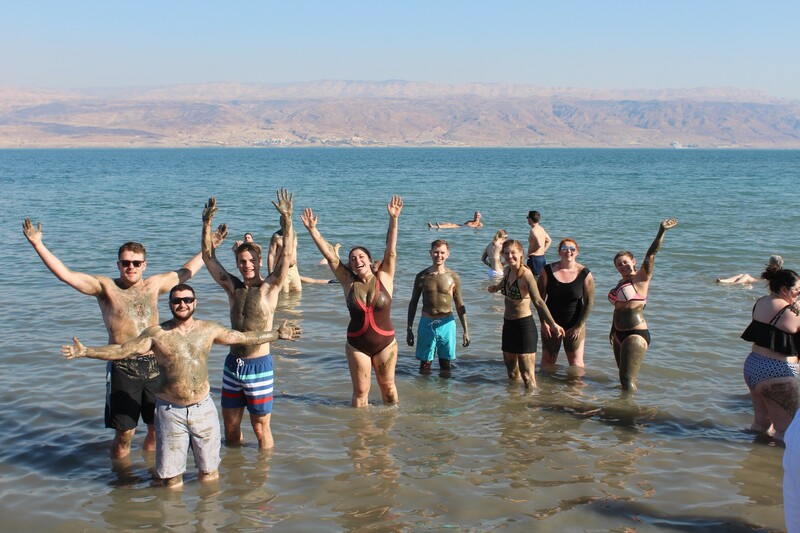 Reflecting on our visit to Old Gesher—a place ripe with symbolism and metaphor—provides a snapshot of how the themes of relativity and gravity wove throughout our journey, and the course of human events in Israel and the Middle East. 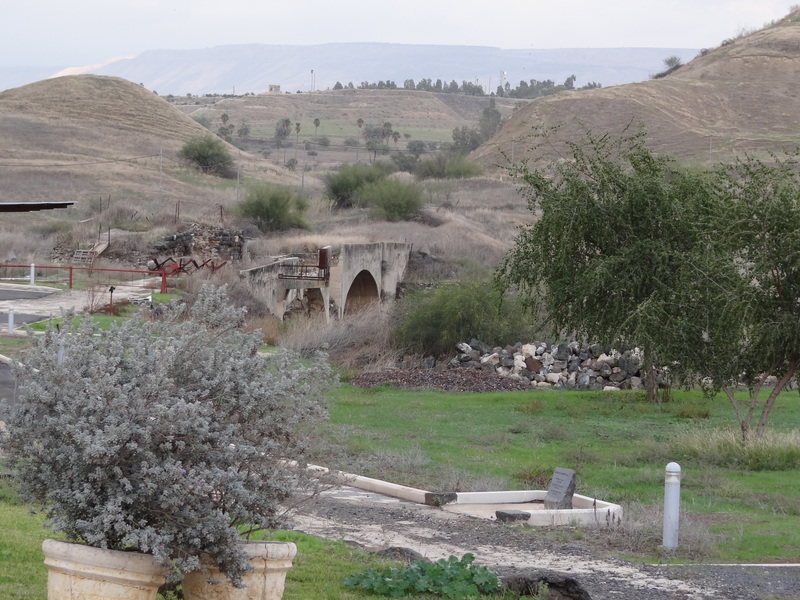 We stopped at Old Gesher as twilight fell over the valley of the Jordan River on our way to Tiberius. 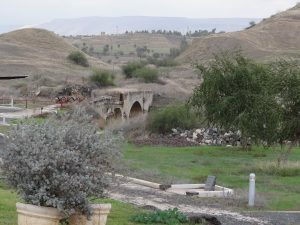 Standing on the grounds, we could see the fence demarcating the border between Jordan and Israel near the confluence of the Jordan and Yarmuk rivers, as well as the standing remains of three historic bridges (gesher is Hebrew for “bridge,” an obvious metaphor for conflict resolution). 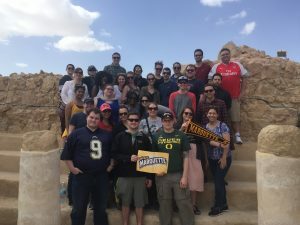 These bridges span not only vital terrain connecting the port city of Haifa to Jordan and Syria, but also epochs of strife-torn history from the Roman era to the Turkish era, and finally the British and modern eras. From student J.J. Moore, here is a reflection on how the story that is told depends on the storyteller. I have always loved ruins. Ruins tell a story and bring an appreciation of the past. However, a forgotten aspect of ruins is the stories that surround them. The combination of beauty and history converge at the ruins of Masada. The utter beauty of the sight, whether it was the preserved ruins or the breathtaking views atop the rock cliff, brought me to a place of deep peace. Let me provide a brief (Roman) summary of the siege of Masada. Following the destruction of the Jerusalem Temple, roughly in 70 BCE, a small band of Jewish zealots maintained a stronghold atop the rock cliffs. The Romans surrounded Masada setting up camps, which are still preserved today, and built a siege ramp to break into the fortress. When the Jewish rebels realized that they would not be able to hold off any longer, they killed their families, and since Judaism prohibits suicide, drew lots to determine the final man to commit suicide. Additionally, the men destroyed everything except the food supplies to show the Romans that they could have withheld, but decided to choose death over slavery. I am delighted to report that two teams represented Marquette University Law School at the Fordham National Basketball Negotiation Competition in New York City this past weekend. Out of the 36 teams participating, the team of Vanessa Richmond and Gabriella Saenz advanced to the Quarterfinals. The team of Sean McCarthy and Brycen Breazeale advanced to the Finals, where the Team was awarded Second Place in a very close decision. Congratulations to all! My list is constantly evolving; however, these ten tips form the foundation of my negotiating strategy and approach. 10. Research. When a new deal comes my way, I do research on who is on the other side of the negotiations. If you are able to find some common ground or interests, you can use some piece of information to start the negotiations in a non-adversarial manner. Knowing something about an alma mater, a law firm, or another part of their business can strike up an interesting aside before the heavy lifting starts. 9. What is your leverage? Look at the negotiation from the other side. It is great when one party can say, “take it or leave it” and really mean it; however, in my experience that is often a rarity. 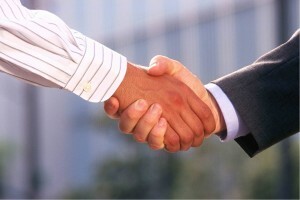 Strength in negotiation comes from knowing what may cause the other side to move on a position. Use that knowledge to best advance your position without being unnecessarily aggressive. 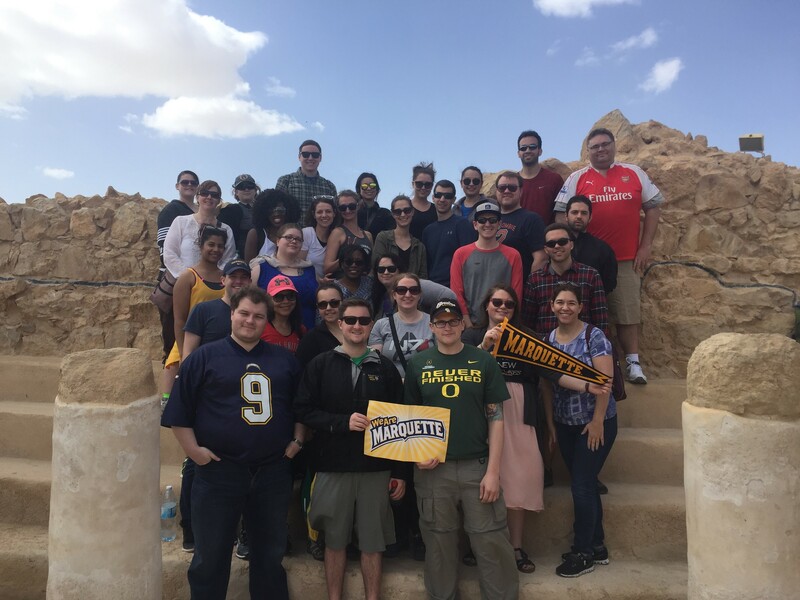 It was a busy weekend for the Marquette University Law School Clients Skills Board, the organization focused on building client-focused practice skills. Cassie Van Gompel and Zach Geren finished 3rd, and Megan Marqusee and David Karp finished 4th, at the ABA Regional Representation in Mediation Competition at Quinnipiac School of Law on Saturday, February 27th. Cassie and Zach had initially tied for 2nd place, missing the semi-final round in the tiebreaker by less than 4 points. 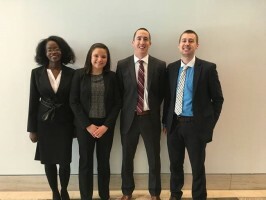 Closer to home, 1st-year students Cody Hallowell, Keegan Girodo, Kelsey Schanke, and Ben Lucarelli beat out ten other 1L and 2L teams to win the Marquette University Law School Intramural Negotiation Competition, also on Saturday, February 27th. Local attorneys, many of them MULS alums, came to Eckstein Hall to judge the competition, providing great feedback to all the teams working to enhance their negotiation abilities. 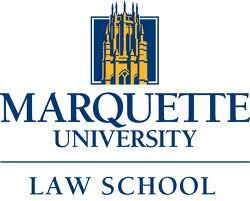 Cody, Keegan, Kelsey, and Ben will represent Marquette in the ABA Regional Negotiation Competition next fall. 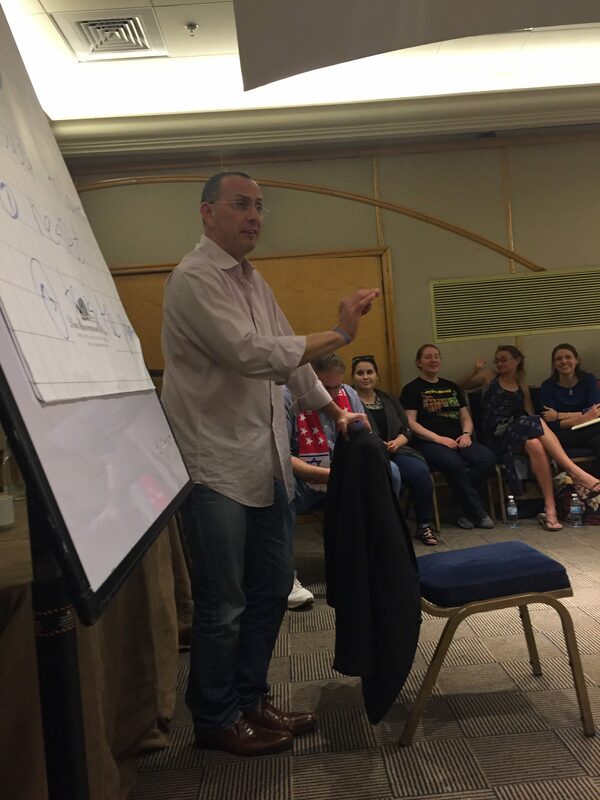 For dinner on our fourth night, we joined lawyers from the region around the Sea of Galilee for a meal and mingling. Much thanks for the yummy food and company to the partnership between this region in Israel and Milwaukee that sets this up every year. 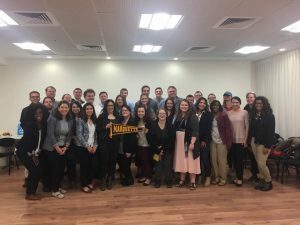 Many students built professional relationships during this meal, gleaned advice from practitioners and professors, and engaged in meaningful dialogue.